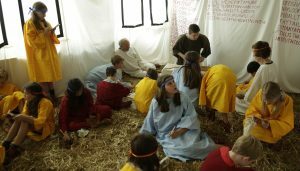 From the blurb: ‘For at least a thousand years Greek cities took part in religious activities outside their territory by sending sacred delegates to represent them. The delegates are usually called theōroi, literally ‘observers’, and a delegation made up of theōroi, or the action of taking part in one, is called theōriā. ‘This is the first comprehensive study of theōroi and theōriā. It examines a number of key functions of theōroi and explains who served in this role and what their activities are likely to have been, both on the journey and at the sanctuary. ‘Other chapters discuss the diplomatic functions of theōroi, and what their activities tell us about the origins of the notion of Greek identity and about religious networks. 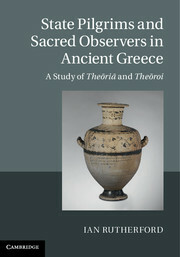 Chapters are also devoted to the reception of the notion of theōriā in Greek philosophy and literature. 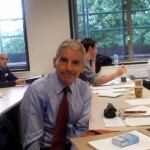 Currently, Prof. Rutherford spends a year as Visiting Scholar at the Institute for the Study of the Ancient World at New York University, where he is working on his project ‘Hittite Texts and Greek Religion: Borrowing, Hybridity, Comparison‘. 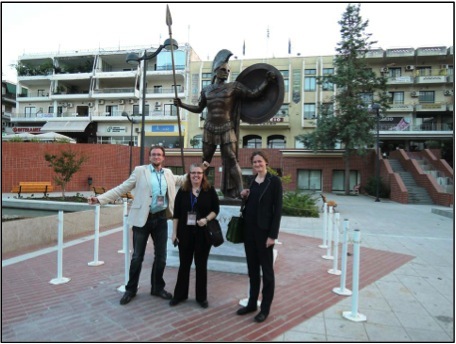 Archaeologists, Classicist and … Homeric hero. Photo courtesy of Margriet Haagsma. If you thought an encounter with the best of the Achaians was beyond the scope of modern mortals, think again: go to Farsala, in northern Greece, and you can bump into him on your way to the zacharoplasteío (cake-shop). The town in Thessaly, roughly on the site of ancient Pharsalos, has recently erected an imposing bronze statue of Achilles, their most famous son. It’s easy to forget, when reading Homer, that Achilles came from Thessaly, but the people of Farsala are clearly in no danger of letting it slip their minds! When questioned, Farsalians said firmly that no, an adjacent statue of Patroklos was not on the cards; but Achilles should at least get his mother’s company, as a statue of the sea-nymph Thetis is planned when funds allow. Farsala was the location of a recent conference on the region which brought together local archaeologists and historians as well as a small number of international specialists on ancient Thessaly, including Dr Emma Aston of RUCD, shown above (at right) in the company of Achilles and some colleagues from the Canadian team who excavated the important south-Thessalian site of Kástro Kallithéas (probably ancient Peuma). 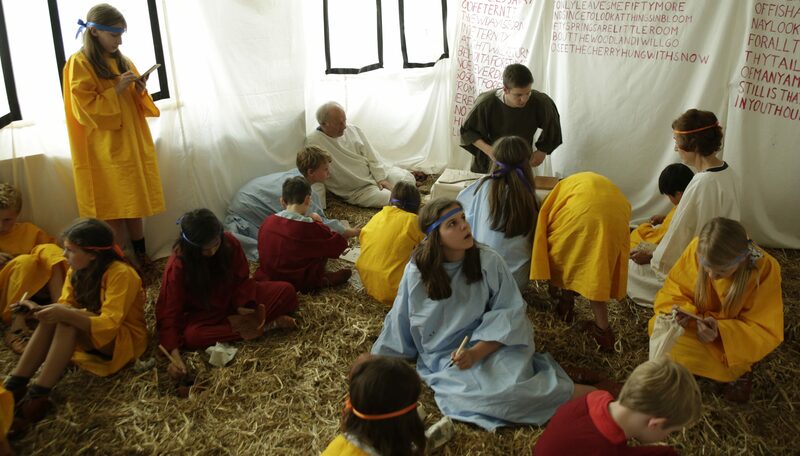 The event was organised jointly by the local Archaeological Service and by the Municipality of Farsala. 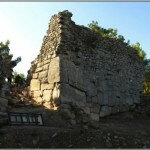 As well as academic papers on a range of Pharsalian topics, the conference included a visit to the ancient acropolis of Pharsalos, still in the process of being excavated, whose fortifications display an impressive range of Archaic, Classical, Hellenistic and Byzantine masonry, testifying to centuries of occupation and embellishment. 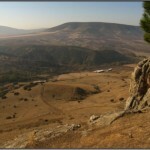 It is also worth noting that southern Thessaly contains some of the loveliest scenery in Greece, wooded hills rising out of the famous horse-bearing plains. View looking north from the acropolis over the gentle hills of Phthiotis. Spot the bee-hives! Photo: Emma Aston. 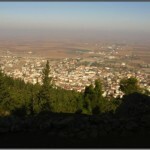 View of modern Farsala from the acropolis of ancient Pharsalos. Photo: Emma Aston. The fortifications of ancient Pharsalos: the large blocks at the bottom are Archaic; the smaller stonework at the top is in fact Byzantine. Photo: Emma Aston. The conference as a whole, and the passion of the local participants, really brought home the extent to which the myths and folktales of ancient Thessaly (Achilles and his family, centaurs, Lapiths, Jason, Asklepios) remain a vibrant part of the local community and its self-perception. It also demonstrated that no conference should be allowed to proceed without tsípouro, a northern Greek liquor of great potency whose stimulating effect upon academic discourse and intellectual engagement cannot easily be overstated. We are delighted that our teacher of Modern Greek, Dr. Dimitra Tzanidaki, is compering an event in London on Friday 8 November to celebrate the life and work of the famous Alexandrian Greek poet Cavafy (1863-1933). The event is being organised by the Embassy of Greece, and will include lectures on the teaching of Cavafy in secondary schools, and readings of selected by poems by Dr. Tzanidaki. A drinks reception will conclude the evening. 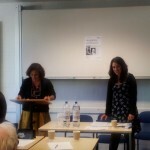 Click here to retrieve a full programme of the Cavafy event. 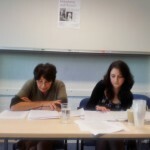 On 4th October 2013 the Department of Classics at Reading, hosted a one-day workshop on the subject of Herodotos and Plutarch. 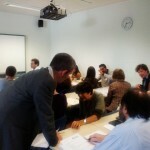 The workshop was organised by two of the Department’s doctoral students, Lucy Fletcher and Niki Karapanagioti, with the support of Professors Timothy Duff and Phiroze Vasunia. We were delighted to welcome as participants: Christopher Pelling (Oxford), Judith Mossman (Nottingham), Timothy Duff (Reading), Michele Lucchesi (Oxford), Tim Whitmarsh (Oxford), Tom Harrison (Liverpool), Aristoula Georgiadou (Patras), Suzanne Saïd (Paris/Columbia), John Marincola (Florida), Carolyn Dewald (Bard College), Rosaria Munson (Swarthmore College), Tim Rood (Oxford) and Phiroze Vasunia (Reading). 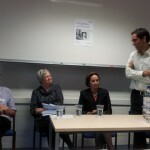 The papers and responses aimed to explore in-depth the relationship between these important Greek authors. Subjects ranged from the representation of individual Greek states in the writings of Plutarch and Herodotos, through Plutarchan re-working of Herodotean material, Plutarch’s peculiarly ethical Herodotos, Plutarch as reader of Herodotos and more broadly the readership of the Histories, and on to more individual instances of Plutarch’s engagement with Herodotos in specific works and for specific historical events and themes. 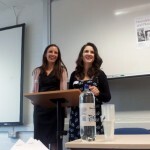 The organisers were delighted with the response they received from interested parties prior to the event, and were pleased to welcome to Reading approximately fifty delegates, including a number of current Reading students – both undergraduate and postgraduate – and staff. The response on the day from all participants was equally pleasing. The papers sparked enthusiastic responses and extensive discussion, as manifest in the way in which we quickly departed from the timings advertised on the programme! The workshop was immensely successful in generating debate and opening new lines of enquiry into this subject as a fruitful area of study. 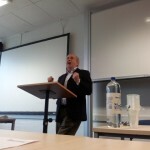 Existing scholarship had focused on Plutarch’s reception of Herodotos in his polemical treatise, De Herodoti Malignitate, and on specific instances where the Histories function as a source within Plutarchan texts. The conference proved particularly revealing, however, of the much greater potential inherent in this relationship as a subject of study for both Plutarchan and Herodotean scholars. It made apparent the value of a retrospective turn to Herodotos from Plutarch for illuminating the text of the earlier writer, and the wider value of looking proleptically at Plutarch from Herodotos. The organisers were extremely pleased with the event, and were delighted to receive so many messages from delegates to express how much they had enjoyed the day, and how much they felt it had achieved. It is a pleasure to take one final opportunity to thank all the participants for making the day so successful and rewarding. 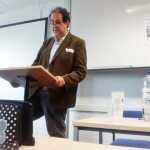 We would also like to thank the Department of Classics at Reading (and especially Prof. Peter Kruschwitz, former Head of Department), the Jowett Copyright Trust, the Institute of Classical Studies, the Society for the Promotion of Hellenic Studies, and the Graduate School at Reading for their support. Lastly, we are delighted to thank Professors Timothy Duff and Phiroze Vasunia once again for their kindness and generosity in offering so much invaluable help and advice. 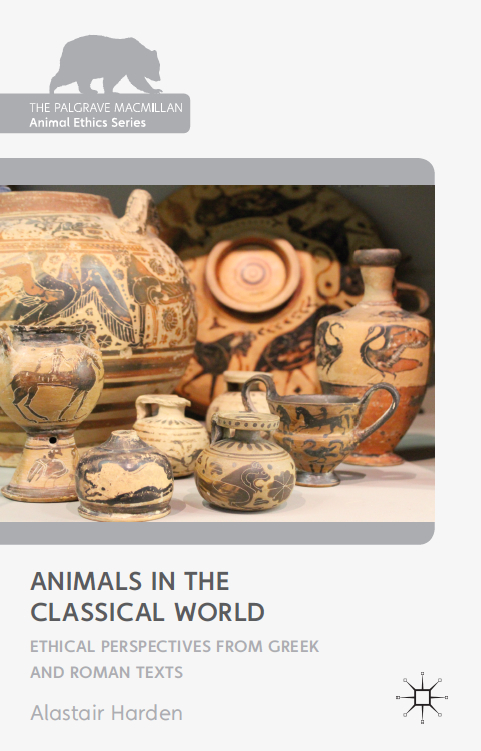 Congratulations to our doctoral researcher Alastair Harden on the publication of his book Animals in the Classical world: ethical perspectives from Greek and Roman texts. The sourcebook is a collection of nearly 200 specially-translated excerpts from Classical authors from Homer to Plutarch. It aims to contextualize modern animal rights debates within the civilizations of Greece and Rome, and to provide an introduction to the uses of animal imagery in Classical literature with the ultimate goal of understanding the place of the non-human animal in the moral and ethical parameters of the ancient world. Topics such as warfare, science, farming, vegetarianism and public entertainment join the more traditionally-philosophical corners of this growing area of Classical studies, and passages are included from authors of all genres of Classical literature including poets, novelists and historians. The book suggests that we can learn as much about ancient ethical parameters from a Homeric simile, a passage of Sophocles or a throwaway comment from Thucydides as we can from the nuanced language of philosophical discourse, if we look in the right places. The book joins the Animal Ethic series published by Palgrave Macmillan (www.palgrave.com/philosophy/animal_ethics.asp) in conjunction with the Oxford Centre for Animal Ethics, which recently founded the new print Journal of Animal Ethics. The photograph on the cover was taken in the Ure Museum. Greek lyric, elegiac and iambic poetry have come down to us through the filter of selection, editing, and commentary by ancient scholars. This amounts to a textual and diachronic context for lyric poetry no less crucial to its understanding than the oral and synchronic context of an original performance. This conference aims to appraise the variety of ways in which the reading of the scholarly ‘paratext’ affects our reading of the lyric poems. 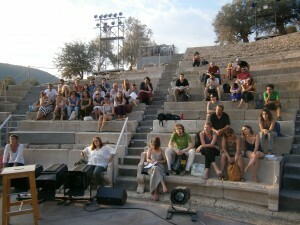 Participants: Lucia Athanassaki (Rethymno), Kristina Bartol (Poznan), Hans Bernsdorff (Frankfurt), Anton Bierl (Basel), Gregor Bitto (Eichstätt-Ingolstadt), Deborah Boedeker (Brown), Elsa Bouchard (Montreal), Ewen Bowie (Oxford), Joannes Breuer (Mainz), Michel Briand (Poitiers), Stefano Caciagli (Bologna), Claude Calame (Paris/Lausanne), Vanessa Cazzato (Nijmegen), Willy Cingano (Venice), Thomas Coward (UCL), Bruno Currie (Oxford), José Antonio Fernandez Delgado (Salamanca), Massimo Giuseppetti, (Roma Tre), Theodora Hadjimichael (LMU Munich), Maria Kazanskaya (Paris), Jacqueline Klooster (Ghent), Peter Kruschwitz (Reading), André Lardinois (Nijmegen), Richard Martin (Stanford), Glenn Most (Pisa/Chicago), Greg Nagy (Harvard), Arlette Neumann-Hartmann (Freiburg), Dirk Obbink (Oxford), Anastasia-Erasmia Peponi (Stanford), Tom Phillips (Oxford), Enrico Prodi (Oxford), Xavier Riu (Barcelona), Jessica Romney (Bristol), Ian Rutherford (Reading), Eveline Rutten (Nijmegen), Renate Schlesier (Berlin), Kristina Tomc (Vienna), Maria Xanthou (Thessaloniki). 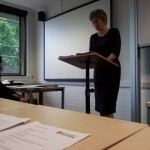 For further details, see: http://www.reading.ac.uk/classics/research/songconference.aspx. 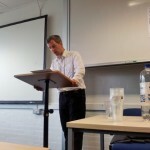 We are very pleased to announce a workshop on ‘Herodotos and Plutarch’ to be held in the Department of Classics at the University of Reading on Friday, 4th October 2013. The event will take place at the University of Reading’s Whiteknights Campus, in the Humanities and Social Sciences Building, room 125. The programme for the day is included below. To register for the event, please send an email to the organisers, Lucy Fletcher and Niki Karapanagioti at the conference address: herodotosandplutarch@gmail.com. The deadline for registration is 15th September 2013. Thanks to the generosity of the Society for the Promotion of Hellenic Studies, we are pleased to offer a number of graduate bursaries. Interested parties should write to the organisers and explain the nature of their interest in the event, and how the topic is related to their studies. The deadline for bursary applications is 8th September 2013. 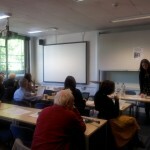 The workshop is generously sponsored by the Department of Classics and the Graduate School at the University of Reading; the Jowett Copyright Trust; the Institute of Classical Studies; and the Society for the Promotion of Hellenic Studies. For further information or queries please contact the organisers: Lucy Fletcher and Niki Karapanagioti at: herodotosandplutarch@gmail.com. 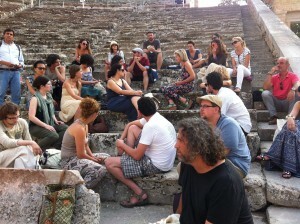 The summer course ‘Challenging Limits: Performances of Ancient Drama, Controversies and Debates‘ brought together for 10 days a brilliant team of 30 students and 14 professors of Classics and Drama Studies throughout Europe to share knowledge and experience of Greek tragedy and comedy in modern theatre. 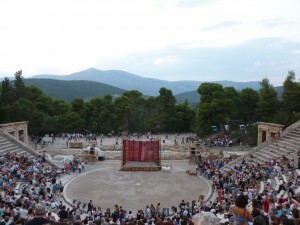 The programme included lectures, workshops, visits to archaeological sites and performances of ancient plays such as Iphigeneia in Aulis by Euripides, Antigone by Sophocles and Plutos by Aristophanes. 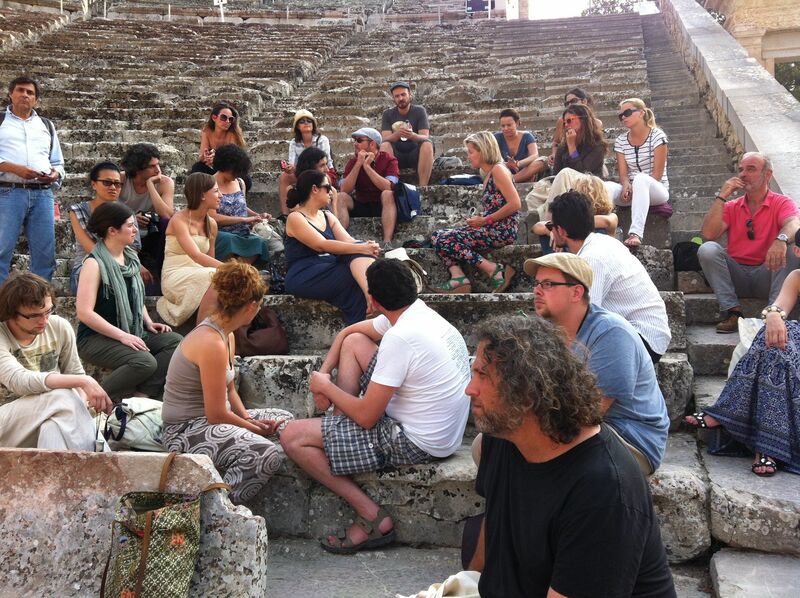 Discussing such problems as ancient and modern theatrical space, adoptation. 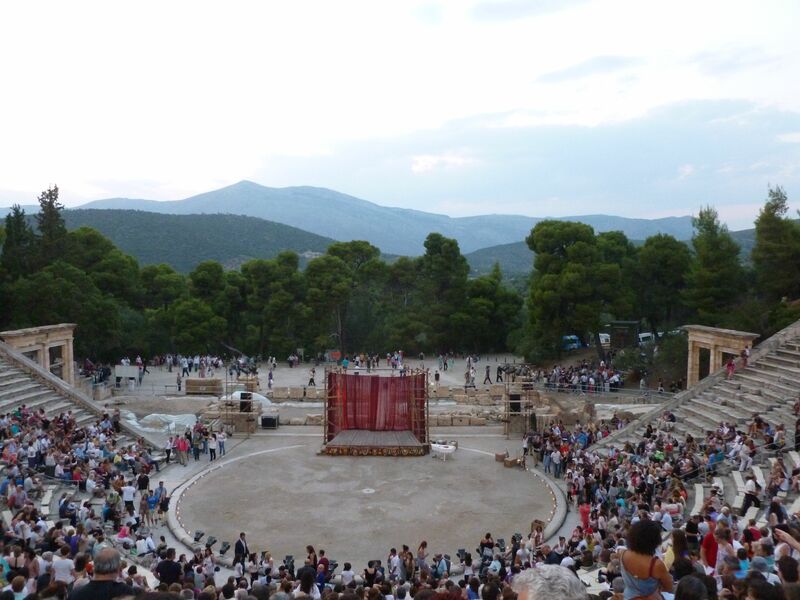 audience’s emotional response, and staging chorus with people who are professionally engaged in theatre production proved to be invaluable experience that changed crucially my ideas about potential of ancient Greek theatre in modern time. The intensive course on the Study and Practice of Ancient Greek Drama is organised annually by the European Network of Research and Documentation of Performances of Ancient Drama (http://ancient-drama.net/) and the Department of Theatre studies of the University of Athens. This year it focused on performances that raised political, social or aesthetic controversies.